WCH: Is this your 1st CD? tms: Yes. I've put out cassettes and EP's with a couple of former bands, but this is my first full-length disc. WCH: How long have you been in the music industry? tms: Wow. Gotta think. Since 1991, when I worked as a DJ in my hometown of Weatherford, Texas. 500 watts, that little AM station put out. That was also when I started my first band in high school. Since then, I've been a record store clerk, a booking & publicity agent, a manager for an online music retail site, a movie critic, a music journalist, a royalty processing clerk, and of course, a musician. WCH: What inspired you to get into music? tms: I originally wanted to be a comedian. I grew up listening to my parents' old records: Bill Cosby, Brother Dave Gardner, and Smothers Brothers. I memorized every routine and made kids at school think I came up with them. Then I discovered Dr. Demento, which made me think I wanted to be a musical comedian. Weird Al was very big back then. Blame the conversion to straight music on teenage depression and Pink Floyd, I guess. But I still make with the wink & the nudge. WCH: How would you categorize your music? tms: I'm still calling it Nerd Pop, though that sometimes conjures images of Weezer, which isn't really my thing. I'd like to be considered a good pop songwriter, but that's such a broad category that it doesn't really describe much. I guess Good Pop would be my goal. Stuff of the caliber of Aimee Mann, Lyle Lovett, & Tom Waits. But there's a more artsy-fartsy element in there too, from my Pink Floyd and Genesis influence. So yeah, Nerd Pop. WCH: How did you come up with the name for the band? tms: I wanted to simply be matthew, but midway into the recording of the disc, I found out there was a band with that name already. So I figured what the hell, I'll add a "the" and a "show" on it & bammo, you're done. Unfortunately, many people have asked me if it has anything to do with The Eminem Show, which it most certainly doesn't. Though if that gives me hip-hop cred, I guess I need all I can get. WCH: How many people are in the band? tms: Essentially it's me, but I recruit players from time to time. There are about 6 other people playing on the album, and one of them, Paul Shapera, plays with me live. It's a very theatrical show with backing tracks & all, but we cover many of the parts ourselves, Depeche Mode style. WCH: How did you decide the style of music you wanted to play? tms: Like I said, I hit teen depression and discovered Pink Floyd through a similarly socially outcast friend. But luckily, the Floyd he introduced me to wasn't the stuff everyone listens to. The first Floyd I ever heard was The Final Cut, which is still my favorite album of all time by any artist. And the focus there is great songwriting around a central theme, which is something I kept in mind while making this album. To me, the album is the form, and the song is merely a movement within that larger work. I think texas reflects that. You feel like you've been on a journey by the time that last track fades. But each song has to stand alone as well. Tricky business. As far as the main musical aesthetic, it comes from a patchwork of collected musical influences: R.E.M., U2, Toad the Wet Sprocket, Paul Simon, Belle & Sebastian, whoever. I'm quite the rummage sale. WCH: One of my favorite songs is The Loneliest Boy In Toyland. How did that song come about? tms: Rather painfully, actually. I have a friend back in Texas who's coming to terms with his alcoholism, and we had just finished having a conversation about how he was turning himself around, and I was so happy. Then another friend called with a COMPLETELY different story of his recent behavior, and I felt betrayed. The song only sounds bouncy because that's the riff I was playing around with the day I got the call. It's really a pretty angry song. Except for the Thomas Kinkade bit at the end. That was me messing around at the end of a vocal take, and my wife made me keep it. Please don't try to figure it out, it makes no sense whatsoever. WCH: Why did you go the independent route? tms: I'd like to say it's because I have deep-seated values that prevent me from compromising my artistic vision. But truthfully, it's because record labels don't exactly beat down the doors of gangly nerd rockers in their late 20's. But that being said, I don't think I could make the kind of album most labels want. I think I'd end up slitting my wrists. So maybe the artistic vision thing is true. Thankfully, people like Aimee Mann and Glen Phillips have been making a great run at the indie thing lately, so I have hope. WCH: Can we expect anything new from you in 2004? tms: Lots of live shows. The disc came out 4 months ago, so it's still convert-the-masses time. However, I have submitted a few new tracks to several compilations, which will come out later in the year. All details will be on the website as they develop. WCH: Do you have any advice for new artists, or people thinking about getting into the music business? tms: Not really. Every artist's path is different, and my road to fruition has been so insane and fraught with peril that I wouldn't necessarily want to recommend it. I guess I would just hope that you'll be yourself. There are THOUSANDS, if not MILLIONS of people trying to change themselves to be what's hip, and the second that dries up, they're toast. Their carcasses are strewn across the barstools of America. My old band flirted with that, and I felt the pull during every sports bar gig and showcase. The voice said, "C'mon, bend just a liiiitle over that way a bit, and they'll love you." But you know what? They won't. They'll like you that night, and they'll forget you tomorrow. When I do a show now, people either think it's the greatest thing they ever saw or it's the worst crap imaginable. But they always remember it. That's where you should be. Don't bend. Be what you are, and if they hate it, they hate it. But when they love it...oh, friend, those are YOUR people. And who will support you in your dotage? YOUR people. WCH: Is there anything else you would like to add? tms: Just that you guys should be thanked profusely for giving an independent artist any attention whatsoever. Everyone listening knows exactly how rare that is, and it should be applauded. 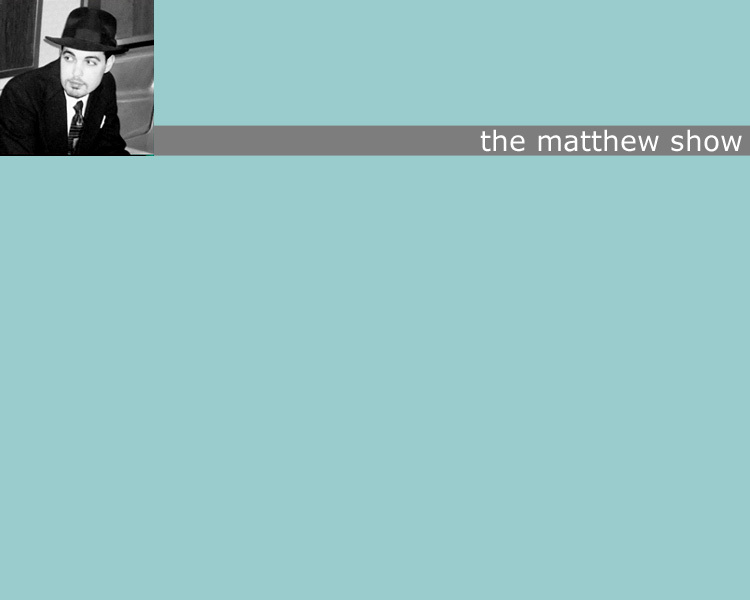 But I'll also mention that if you want the full matthew show experience, you should check out the website as well. There's a lot of thoughtful prose, fun features, plus my own radio station I run through Live365. The website is definitely a companion piece to the music, I'm told by my readers. Plus, Office Suite, Part I is available for free download, along with Bring Me Safely Down. Load up those newfangled pocket jukeboxes and make mix discs for your friends. Am I done, or can I have another twenty pages? WCH: Thank you for your time.